The Westwood Young Women's Club will be hosting a food drive during the month of April in honor of Eddie Thomson, who passed away at the age of 6 in November 2017. Providing meals to those in need was an important cause to Eddie and his family. Collection bins will be available at the following Westwood locations from April 8-30: ARCH Orthodontics, Dental Arts of Westwood, Islington Public Library, Roche Bros., Temple Beth David, Tobin School, Westwood Children's Center, Westwood Family Chiropractic, Westwood Public Library, and the Westwood Senior Center. Most needed items include: baking mixes, canned peaches, cleaning products, peanut butter & jelly, salad dressings and small packages of flour and sugar. All goods collected will be donated to the Westwood Food Pantry. Bring a blanket and join us at the gazebo outside of the Senior Center (60 Nahatan Street) for a free summer concert featuring Vanessa Trien and the Jumping Monkeys! Pizza is available for purchase. The Snowie Bus will be selling snow cones for $3. Proceeds from sales support the WYWC. Bring a blanket and join us at the gazebo outside of the Senior Center (60 Nahatan Street) for a free summer concert featuring Karen K and the Jitterbugs! Proceeds from sales support the WYWC and their donations to Westwood. Bring a blanket and join us at the gazebo outside of the Senior Center (60 Nahatan Street) for a free summer concert featuring Stacey Peasley! Bring a blanket and join us at the gazebo outside of the Senior Center (60 Nahatan Street) for a free summer concert featuring The Bubble Music Man! Bring your own basket and join us for a free family-friendly egg hunt! The hunt starts promptly at 11 AM! You can also make a day of it and start your morning at the Rotary Club's pancake breakfast at 8:30 AM in the Westwood High School cafeteria, featuring visits with the Easter Bunny, crafts, and music. The hunt is free, but donations are always appreciated and support the WYWC. Join us this year for Winterfest at the Westwood High School! Activities include train rides, pictures with Santa, performances from Miss Janet's Dancing, face painting, cookie decorating, and more! $10 per child, $20 family max. Please use this link to access our Interactive Google Map of all the Yard Sale Sites. You can also view the map below or download the PDF version by clicking on the first image. Registration for the Town Wide Yard Sale and Clean Out Day now closed. Pizza is available for purchase. The Snowie Bus will be selling snow cones for $3. Proceeds from sales supports the WYWC. Join us this year for Winterfest at the Westwood High School! Activities include a train ride, pictures with Santa, performances from Miss Janet's Dancing, face painting, cookie decorating, and more! $10 per child, $20 family max. There are 12,000 homeless women and 10,000 homeless girls in MA who a face humiliating reality: limited or no access to feminine hygiene products. Dignity Matters is an organization that strives to provide free feminine hygiene products and underwear to those women and girls who cannot afford or readily access them. Your donations of gently worn or new bras, pads, and new underwear (from age 5 - to all adult sizes) help them stay healthy, boost school attendance, and live with basic dignity. To donate, visit our Dignity Matters page to view location details. Held on the front lawn of the Westwood Senior Center. Bring a blanket or lawn chair and enjoy the concert! Pizza, water, and snow cones will be sold. Bring a blanket or lawn chair and enjoy the concert! Pizza, water, and snow cones will be sold. The event will be held during Westwood Rotary Club's Easter breakfast, which is at the Westwood High School. 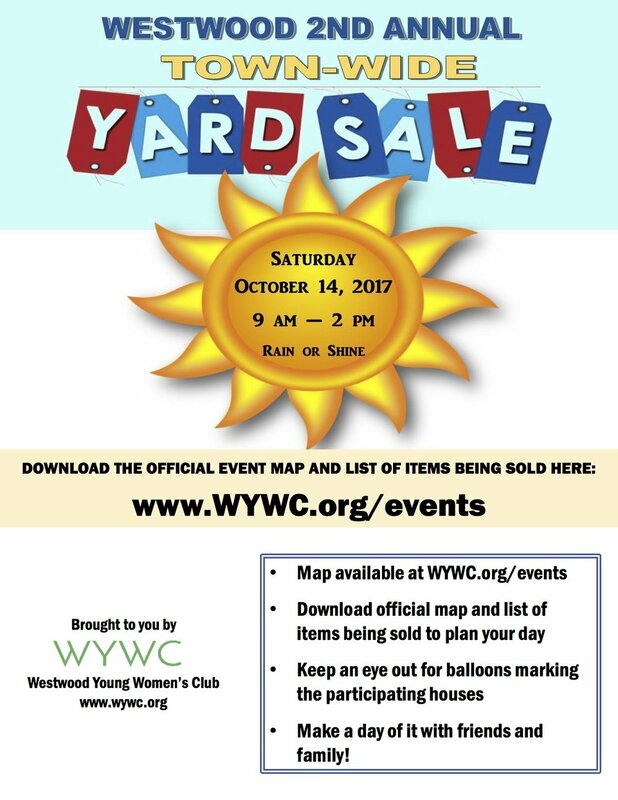 Be part of the 1st Annual Westwood Town Wide Yard Sale. For more information and to register, visit our EventBrite page. The event will be held during Westwood Rotary Club's Easter breakfast, which is at the school.